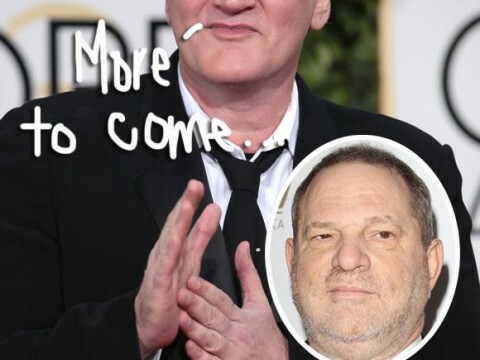 Home Abs Quentin Tarantino Finally Breaks His Silence On Harvey Weinstein’s Scandal! Quentin Tarantino Finally Breaks His Silence On Harvey Weinstein’s Scandal! With so many bravely speaking out to condemn Harvey Weinstein‘s inappropriate behavior amid his sexual harassment and assault scandal, Quentin Tarantino had little to say. The director, who has been longtime friends with the disgraced Miramax cofounder, released a short statement on the controversy via Amber Tamblyn on Thursday. It’ll be interesting to hear what he has to say. It was the same with Cosby. So many men needing to process knowing this about their hero… no mention of the women. Guess we’ll have to see! Previous articleVictoria Beckham Always Starts Her Day With… Vinegar!